Summer Plant Lab a Success! 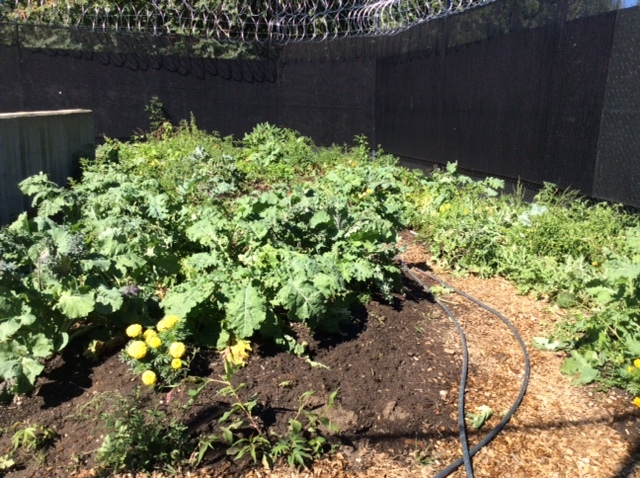 We are excited and honored to be celebrating the end of an eventful growing season at a new site, working with detained youth in Boston in partnership with the Department of Youth Services. To get this project off the ground, The New Garden Society (TNGS) designed the Summer Plant Lab, a six-week intensive followed by 10 more weeks of extended growing season, which involved all 36 students/residents at the facility. The students met with Youth Horticulture Educator Laura Jones twice a week for 90-minute classes in July and August, then a couple of times a month through late October. In early July, the Summer Plant Lab youth participants started with a bare patch of grass in a corner of the field. They hauled soil and shaped it into beds according to our garden design, layered the curving paths with a thick bed of mulch, and planted in over 200 seedlings. Most of these vegetables and herbs had been donated to TNGS by generous supporters. For many of the youth, this was their first time planting anything; for others, the idea of a garden reminded them of what they had experienced in their more tropical home countries. All soon got comfortable digging in the soil, and made friends with a lot of worms. Everyone tried something new and helped out, and a generous handful of very avid gardeners emerged. Site teachers told us these students who lit up in the garden, took responsibility for tasks they saw needed to be done, and enjoyed observing and experimenting with what they were growing were often students who had an extremely hard time staying engaged in other classes. Mid-summer, there was near-unanimous agreement that the favorite garden plants were chocolate mint and stevia/sweet-leaf, preferably enjoyed together. Over the summer "break", student residents stepped up to maintain the garden, watering and looking after the plants. Many students said they just enjoyed watching the plants grow, and taking care of them. "Where can I find a job doing this when I leave?" was a question we heard on several occasions, along with, "When I have a garden of my own I'm gonna plant...". Come harvest season, residents were literally crashing into each other as they ran around the garden to collect mature peppers, tomatoes, watermelons, eggplants, beans, cabbages, cucumbers, radishes, and heaps of kale and lettuces. Students who started the summer saying, "These plants are all gonna die - this is stupid" we now calling out, "It's a jungle!" Even the staff, at first often reticent about where this program was going, expressed enthused amazement at the garden the students had cultivated. We ate lots of produce on-site, especially enjoying juicy melons and tomatoes. More produce went to the facility kitchen to be incorporated into residents' meals. But perhaps the most satisfying for the residents was when they decided to pick big armloads of produce and give them to their teachers to take home and enjoy, along with little bunches of flowers -- these gifts meant a lot. Next growing season, those youth gardeners will hopefully be home, perhaps thinking about their food and how nature works a bit differently, possibly working in landscaping, maybe watching their own plants grow or working with neighbors or elders to take their own next steps. For our part, it was a pleasure and an honor to be part of this growing experience.